Summary: The description, specs, photo, pricing and user ratings for the Rock River Arms 1911-A1 Tactical pistol. The 1911-A1 Tactical from the right. RRA says this pistol is dehorned for carry and tuned for reliability, and it guarantees it will shoot 2.5″ groups at 50 yards with 185-grain Federal Gold Medal Match semi-wadcutter ammo. 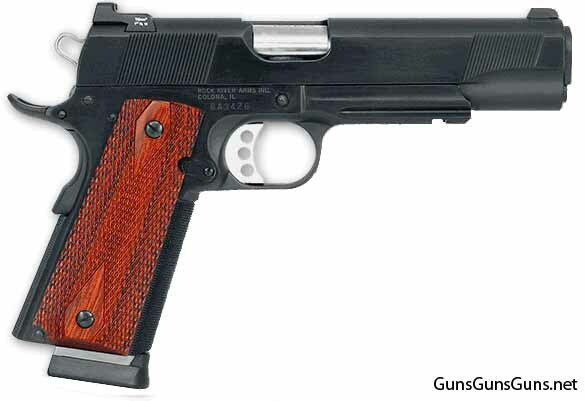 This entry was posted in .45 ACP, $2,001-$2,250, 1911, Full size, Rock River Arms, Semiauto on October 21, 2015 by Staff.